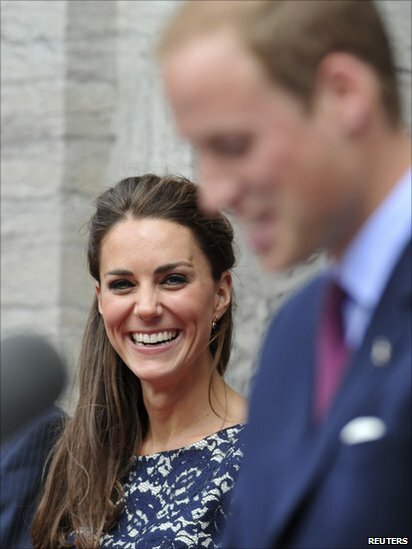 The Duke and Duchess of Cambridge are visiting seven Canadian cities in eight days in Canada on their first official overseas tour. Catherine wore a purple dress by Issa - with a maple leaf brooch loaned to her by the Queen - as they watched a fireworks display in the capital Ottawa. 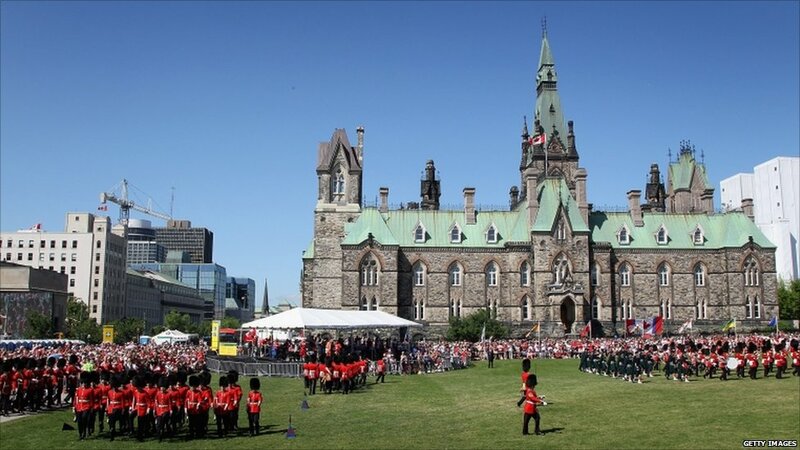 The royal couple were guests of honour in the city on Friday as they celebrated Canada Day on Parliament Hill with around 100,000 people. The national holiday marked the country's 144th birthday. 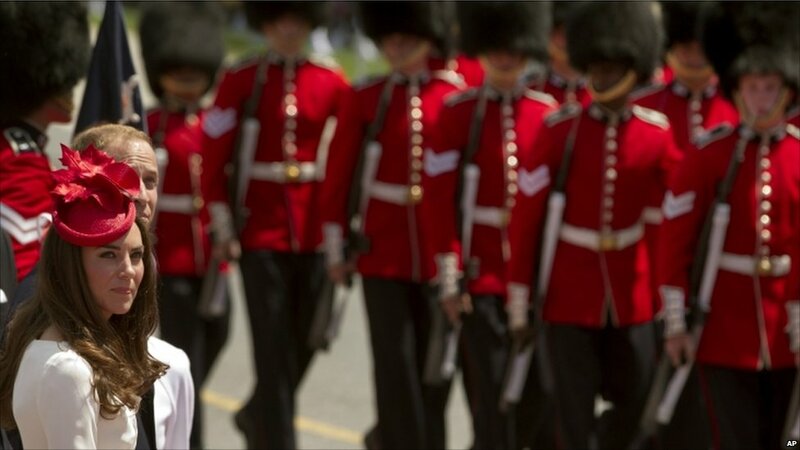 Amidst formal military parades, the duke - an officer in the Royal Air Force - paid tribute to the efforts of Canada's Armed Forces who fought at Vimy Ridge in World War I and on Juno beach during the D-Day landings of 6 June 1944. At a citizenship ceremony in Gatineau, near Ottawa, the recently married couple presented national flags to 25 new Canadians who had come from 12 different countries. They will later plant a tree in the grounds of Government House. The cost of the visit to the Canadian government, not including security, is estimated at 1.4 million Canadian dollars (£958,600). 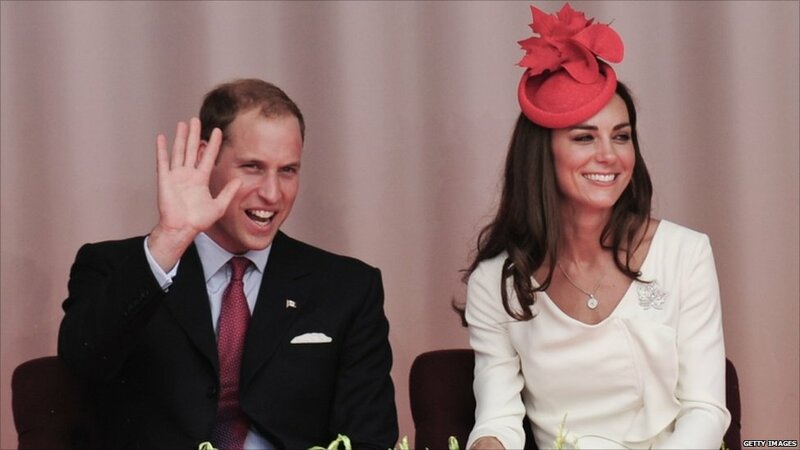 Catherine's red hat featured a maple leaf - the national symbol - and she wore a white dress to match the colours of Canada's flag. 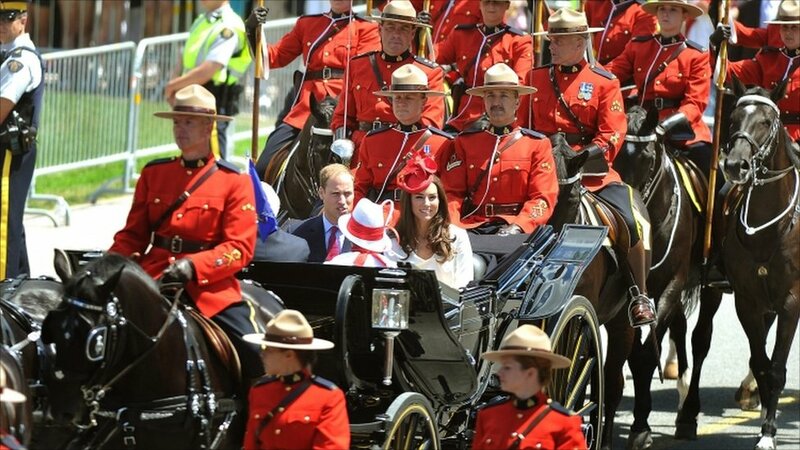 A horse-drawn landau took the royals to Ottawa's Parliament Hill for a music and pageantry event, known as Noon Show. They are due to visit the province of Quebec where they are expected to face protests from a small group of separatists. Canada has created a new royal flag for the visit. It features three maple leaves - from Canada's national tree - at its base. 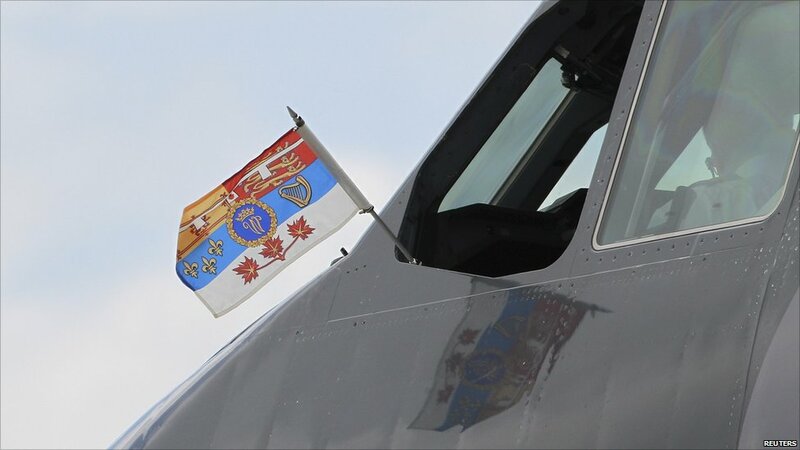 The flag was flown from the cockpit of the jet carrying the royal couple and it will also fly from their cars and buildings they are visiting or staying in. 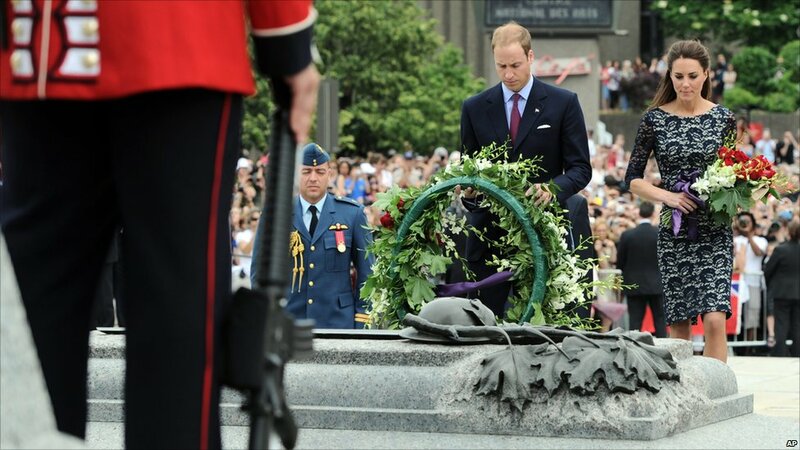 The duke laid a wreath at the National War Memorial in Ottawa and his wife Catherine placed a bouquet of flowers. 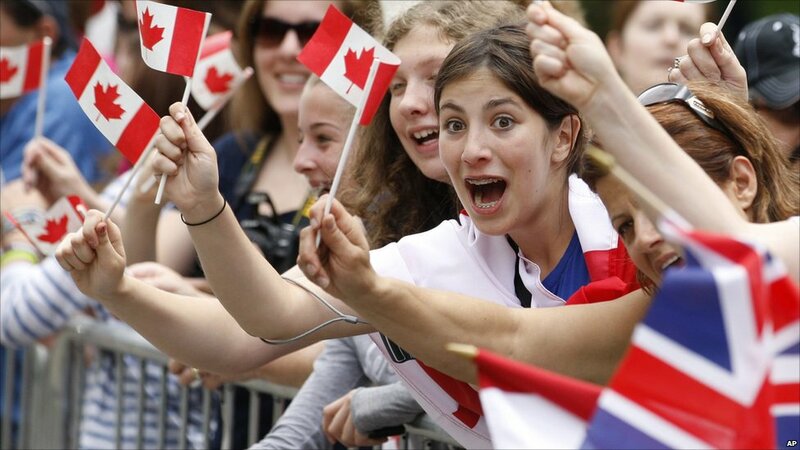 They will later meet Canadian servicemen and their families. The duke and duchess left the memorial for the residence of Canada's governor general - known as Rideau Hall - for an official welcoming ceremony. Excited crowds were already gathering along the route to the residence before their plane had landed. 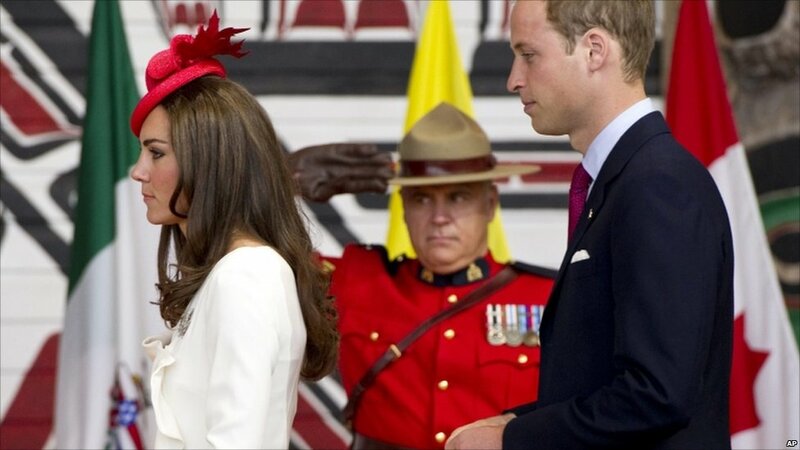 Governor General David Johnston welcomed the couple to Canada, the "honeymoon capital of the Commonwealth". The duke addressed the assembled crowd in French and promised it would improve during the tour.